Virat and Anushka have been giving us goals ever since they exchanged vows in a secret wedding ceremony in Tuscany, Italy. Right from their wedding in Tuscany to their wedding reception in Delhi and Mumbai, they have been doing everything in style. It’s been a month that the two got married and we still aren’t over their love! We are still in love with their wedding pictures and the adorable way in which they announced their wedding to the world. Even after their marriage, they kept trending all over and looks like this is going to pass on for a long time now. Recently, Virat and Anushka were together in South Africa where the Indian Cricket Team is playing. Lately, Virat played exceptionally well as he scored a 150. It was absolutely adorable to see Virat kissing his wedding ring that he wears around his neck in a chain. Awwww! 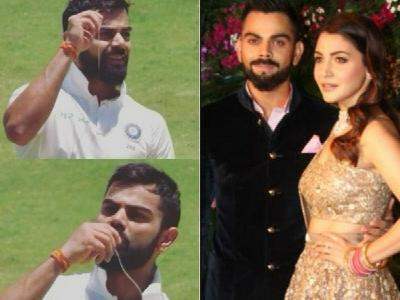 Yes, Virat’s way to thank wifey Anushka Sharma clearly shows that he loves her with all his heart and will never shy away from showing his love to her! Well, Virat is truly setting goals for all the men out there. Though Anushka flew back to Mumbai to continue shooting with her ‘Zero’ team that includes Katrina Kaif and Anushka Sharma, Virat send across his love for her by kissing their engagement ring. Meanwhile, here is a little throwback of their beautiful wedding. Enjoy! Next story Sonam Kapoor finally reacts to her marriage rumours with Anand Ahuja!